While the Vikings won’t have center Pat Elflein for the first week of the season, they’re not expected to be without him for long. Elflein was be activated from the physically-unable-to-perform list on Saturday, and a league source said he will participate in practice this week. He won’t be ready for the Vikings’ regular-season opener against the 49ers, the source said, but shouldn’t be out long, provided he handles contact in practice without any issues. 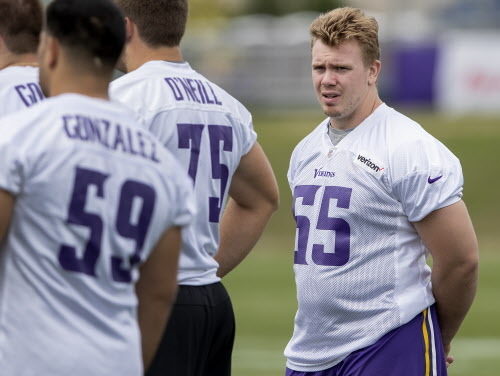 Elflein had shoulder and ankle surgery this offseason, and has spent training camp on the PUP list, while the Vikings sorted through their other options at center. They started Danny Isidora in their fourth preseason game, while playing Brett Jones — whom they acquired in a trade with the Giants last week — at center in the second half. If all goes well with Elflein, however, the Vikings shouldn’t have to sort through their backup plans for long. It’s big news for a Vikings team that has battled offensive line injuries throughout the preseason, losing Nick Easton to neck and back surgery and working without both Mike Remmers and Rashod Hill for part of the preseason. Elflein stood out as a rookie, starting 14 games until the shoulder injury he first sustained against Atlanta caused him to miss two of the Vikings’ final four regular season games. He fractured his ankle in the NFC Championship Game, and has been working back from both injuries since.